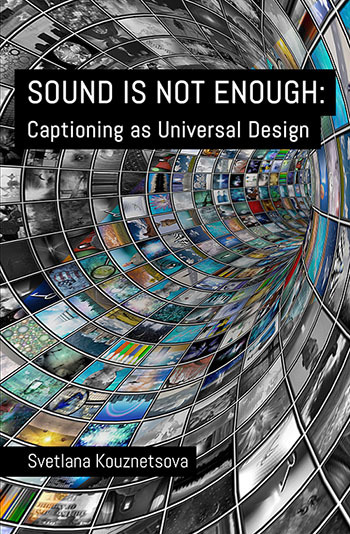 The following is a preview of the first few pages of Sound Is Not Enough: Captioning as Universal Design. It is available in paperback and digital versions on Apple iTunes, B&N Nook. Copyright 2014 by Svetlana Kouznetsova — All rights reserved. There are forty-eight million deaf and hard-of-hearing consumers in the United States who are ready to attend your event or use your product or service. If you have only been delivering your message orally, you haven’t been able to reach them. They don’t hear it or cannot access it for various reasons. This book is going to show how to reach that audience so they will use your products or services—whether or not they are free. It’s not hard or expensive, though it does take a commitment to share your oral message via speech-to-text translation (captioning and transcription). Depending on where you live, you may have seen captions on TV in public places (such as gyms, bars, and airports), on many movie DVDs, or on the electronic displays of new public transport systems. Many people think of captioning as something that is used only for TV and movies, but with more awareness and more efforts to make captioning universal, it could be used to access any aural information, anytime and anywhere. You don’t even have to be deaf to rely on text to get information. The world is noisy. People mumble, and there is a lot of poor audio. People listening to foreign speech find it easier to follow along with same-language captions, which can also help them improve their new language skills. There are many ways we can apply captioning in various areas of our lives once more people realize its benefits. The use of captions for TV and movies has increased in the past years in more countries, including the United States, which is wonderful. Imagine the positive impact if businesses, media owners, event organizers, educators, and employers were sensitive to the fact that 642 million deaf and hard-of-hearing people around the world could also be included by adding captioning to podcasts, videos, movies, webcasts, plays, live events, classes, meetings, and any other situation in which information is conveyed aurally. Businesses that made such changes would definitely have a competitive edge. Yet just captioning without care is also inadequate. Another thing to consider is the quality of speech-to-text translation. It is not enough to just add words. They need to be of good quality, with speaker identifications, sound descriptions, and proper grammar and punctuation. They also need to be verbatim, easy to read, and synchronized with speech. Many think that just using speech recognition software is good enough because they do not realize that it cannot produce quality transcription on its own. It is of paramount importance to consider this issue in relation to recorded media and, especially, to formal live events. rely on text translation for various other reasons. This book is intended for businesses, media owners, event organizers, educators, and employers, as well as people interested in in pursuing a career in realtime captioning for live events—the demand for that profession is growing rapidly. The book helps hearing people see the world through my eyes as an experienced deaf professional and better understand how to improve communication and information access via quality captioning and transcription. 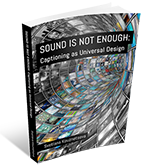 It includes a mix of my personal experiences, summaries of case studies, and some general examples of captioning best practices. Most of the information in this book is related to communication and information access in the United States, but the section titled International Communication Access addresses issues abroad. While I support all communication modes (sign language, cued speech, lipreading, listening via amplification, and so forth), this book focuses on speech-to-text translation, because it benefits more people than just those who are deaf or hard-of-hearing. I do not mean to look down on other communication modes which are equally as important for certain people in certain situations. This book cannot contain solutions for all situations, so you may need to hire a consultant to give you customized solutions for communication access and also do a quality check of captions and transcripts to ensure that they follow guidelines and improve user experience. Accessibility information will undoubtedly change after this book is printed. You can learn more about news and solutions from my articles, presentations, and/or consulting sessions that can be found in the About the Author section. I hope that this book will help more people with normal hearing better understand why even small things do matter to those with little or no hearing. People with normal hearing can easily overhear other people’s conversations, gain access to education, and participate in meetings and social events, while deaf and hard-of-hearing people either do not receive this spontaneous information or must work very hard to get it. Reverend Jesse L. Jackson said, “The problem is not that the [deaf ] students cannot hear. The problem is that the hearing do not listen.” Sadly, hearing loss carries a social stigma. Deaf people are disabled by society’s attitudinal barriers as much as by physical ones. These could be easily removed so that deaf people would not have to work harder than those with normal hearing. They would feel fully included if society would provide them with alternative ways to communicate and exchange information. Full and equal communication access is our basic human right, not a privilege. They need to feel connected just like everyone else. Deaf and hard-of-hearing people are not the only ones who have difficulty processing aural information. Even people with normal hearing find themselves in situations that make it hard for them to hear or understand audio or each other, so alternative methods of communication can help them, too. I look forward to a time when more of us can enjoy full access to communication and information exchange, and when captions are so widely used along with audio that future generations will find it hard to believe that generations before them could live without universal access. Let’s think outside the EARS! Blindness cuts you from things. Deafness cuts you from people. Hearing loss and deafness are not simply the inability to hear well or at all, but more an inability to communicate with hearing people via audio only. This is what makes many of us—even those with mild hearing loss—feel left out if we are not intentionally included. Communication access is very important to us. Before understanding the various communication needs and abilities of people with hearing issues, it is first necessary to understand the nature of deafness and hearing loss. It can happen anytime and to anyone, so it is not limited to senior citizens. Actually, the leading cause of hearing loss is not age, but the constant exposure to loud noises and listening to portable music devices, which has increased the number of deaf and hard-of-hearing people in the past few years, especially among the youth. This brings us to the end of the free preview. Below is the full table of contents so you can get a sense of where things go from here. Why Is There a Lack of Support? If you are interested in purchasing the book, it is available in paperback and digital versions on Apple iTunes, B&N Nook.